Nearly 17 percent of people over age 50 are moderately burdened, spending from 30 percent to 50 percent of their income on housing. Another 16 percent spend more than half of their income on housing. Some 3.9 million households over age 62 are eligible for rental assistance – but only 1.4 million receive it. In 2010, about three out of four homeowners ages 50 to 64 were still paying off a mortgage, up from about two in three in 1992. Housing costs are especially challenging for minority groups: 39 percent of older Asian households, 43 percent of older Hispanic households, and 46 percent of older black households have moderate or severe house cost burdens. The figure for older white households is 29 percent. 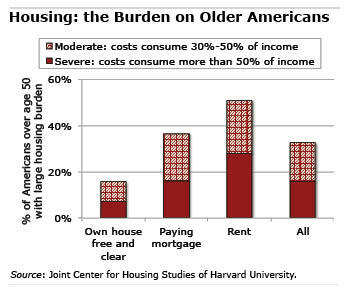 Housing reliably consumes a large chunk of retirees’ monthly income. As baby boomers prepare for retirement, many should consider reducing their housing costs so they fit their new retirement budgets. The simple answer is not easy for Americans to swallow, but in difficult times , one must take sever actions: MOVE OUT OF AMERICA! An American can live well in Thailand on $2,000 USD/month! With none of the crime associated with Central and South America and access to medical care that is 1/10 of that of USA. And I don’t mean witch doctors, CAT scans, digital x-rays and competent, but not opulently wealthy physicians.